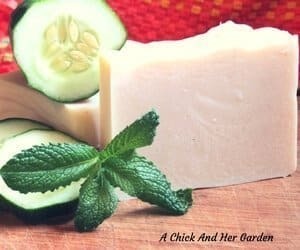 This all natural cucumber mint soap is the perfect balance of refreshing and moisturizing! What could be more refreshing than a Cucumber Mint Soap?? This all natural soap is perfect for hands, body or face! Cucumber is said to improve complexion, sooth the skin, and fade freckles (not that we don’t like freckles here!). While mint is an antiseptic skin cleanser and can relieve itchiness and skin irritation. Throw in some moisturizing Shea Butter and you have a perfect balance!